Advances in modern medicine have forever changed the shape of cures for disease, human health and well-being. Consider that less than a century ago, the average person in a developed country usually didn’t live to see their 60th birthday. Now, it’s common for people to live longer than 80 years old. But we’re facing a big problem: the over-prescribing of possibly dangerous and addictive medications. Additionally, the United States healthcare system encourages doctors, hospitals, and insurance companies to order more tests (e.g., CAT scans, blood count tests, etc.). For this reason, many people undergo procedures that they often do not need. It wasn’t always this way. In many places around the world, it is still an unacceptable practice. Today, we’re going to discuss 25 ancient medical cures that most people have forgotten, including procedures and also herbs/spices. You may find it surprising that people still use many of these cures today, especially those in the “herbs and spices” section of this article. Here are 25 ancient medical cures that most people have forgotten! Modern research is starting to – albeit reluctantly – attest to the effectiveness of acupuncture. The ancient science of acupuncture has roots in China, beginning as far back as 6000 BCE! “The Chinese were the first to recognize that changing the bacterial flora of the colon could be a beneficial treatment,” says Dr. Bret Lasner, a gastroenterologist at the Cleveland Clinic. Gross? Yes. Effective? Absolutely. Records show that leech therapy dates back over 3,500 years to the ancient Egyptians. Today, leeches serve as an anticoagulant (blood thinner). They also boost blood circulation. The use of maggots to heal wounds has been around for centuries. Military surgeons during the Civil War observed that soldiers treated with maggots for injuries sustained in combat had a lower mortality rate. Today, the therapy primarily treats soft tissue and skin trauma. Certainly, this one’s a bit freaky. Back in the days o’ yore, “doctors” drilled a hole in the skull with the purpose of … get this … releasing evil spirits. Well, thankfully, trepanation now involves state-of-the-art surgical tools – and only to relieve pressure in the skull. Catheterization involves a tube inserted into the urethra, traditionally done to allow an immobile person to urinate. Back in medieval times, catheterization was used much more often due to the widespread occurrence of bladder and kidney stones, syphilis, and other diseases. And they used metal! Uh, no thanks! The oft-practiced Cesarian section (or “C-section”) originated way back in around 320 B.C. Of course, the procedure has evolved – and for the better. Today, nearly one-third of all babies are delivered via c-section. The mortality rate of the delivering mother has also plummeted. Many of the herbs and spices you will find on this list were first used by Native Americans and practitioners of traditional Chinese medicine (TCM). Many of these natural remedies have since been proven by medical research as effective alternative treatments. One example? This little-known cure, aspirin, which is contained within walnut crust! Rich in vitamins A, C, E, and K, alfalfa helps reduce symptoms of asthma, arthritis, bleeding disorders, high cholesterol, and an upset stomach. Among the oldest medicinal plants in recorded history, Aloe Vera contains a myriad of amino acids, enzymes, minerals, and vitamins. It aids and promotes digestion, nutrient absorption, and skin health. Packed with just about every healthy mineral in existence, pollen serves as a potent antibacterial, antifungal, and antiviral agent. It can also help lower cholesterol, reduce inflammation, and protect cellular bodies. Oft-used as an ingredient to make tea, blackberries aid in the treatment of diarrhea and inflammation. Some tea drinkers swear by it, and for a good reason. Chamomile does a bit of everything, including treat the common cold, reduce stress, and fight the aging process. More and more research points to curcumin (found in turmeric) as an effective treatment for gut-related disorders. Curcumin also demonstrates BDNF growth properties, which researchers say may help delay or prevent the onset of dementia. Another tea ingredient, Native Americans first discovered the benefits of echinacea. Some evidence suggests that it may be elemental in strengthening the immune system. Now manufactured mostly as a tincture, elderberry chiefly helps to treat respiratory illnesses. Studies show that the chemicals within elderberry effectively relieve nasal congestion. They also have potent antioxidant properties, which serve to protect our trillions of cells. Besides making for one killer cup of tea, ginger has some Grade-A benefits. It contains anti-cancer, anti-inflammatory, and antioxidant properties. It also sharpens cognition and boosts metabolism! Gingko is probably the oldest item on this list, dating all the way back to when dinosaurs (yes, dinosaurs!) roamed the earth. A star in Chinese medicine, gingko biloba promotes healthy blood circulation. Additionally, it is touted for its brain benefits. Another favorite tea ingredient, its proponents believe ginseng boosts energy, reduces blood sugar, lowers cholesterol levels, fights stress, enhances brain function, and even treats erectile dysfunction. Because of its use in various digestive and respiratory disorders, you can think of honeysuckle as a jack-of-all-trades. Additionally, it’s even used as an aromatherapy agent. First of all, mint is fantastic as a reliever of intestinal discomfort. It also serves a double role in the gut by promoting digestion. Recent research suggest that mint may also have a positive impact on brain health and function. Mullein was a plant that found extensive use in Native American culture. The natives primarily used it to treat respiratory disorders and inflammation. A favorite of aromatherapists, rosemary supposedly boosts metabolism, improves circulation, and also treats inflammation. Besides acting as a natural insect repellent, sage also purportedly treats digestive disorders. Many also use it in the prevention and treatment of respiratory illnesses, including the common cold. Valerian root is known for its ability to help relieve feelings of stress and anxiety. Aside from its positive effects on the nerves, Valerian may help alleviate muscle pain. 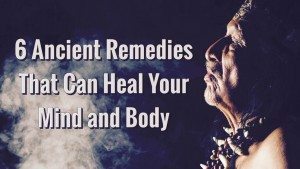 Valuable Secrets Of Native Americans: The Long Forgotten Medical Cures Of Ancient Tribes!